Here are some comforts both for the stomach as well as the mind. Sheperd's Pie or Cottage Pie as it's called when made with beef is one of the best meals that you can have on a cold night. A hot pie just out of the oven will put you in a state of mind like nothing else can. This is my version....ground turkey, ground pork, carrot, onion, celery, seasonings, a mashed potato top crust, and grated cheddar cheese. Even when the day saw you fall in the stream, loose a big fish, as well as a fly or two....sitting down and enjoying this will make the hurt go away. How about starting your day with this? Creton, a French pork spread. This stuff spread on a slice of toast will put you in a great mood to start the day. Creton packs well too. Put some in a little container, a few of your favorite crackers and you have lunch, or a snack. Creton can be served hot or cold. This article gave me some comfort when I read it...I hope you'll enjoy it and also get the comfort that it gave me. The soft-hackle, there are probably more patterns tied using this style than any other type of fly, with the exception of the nymph. And in this group of soft-hackle flies is the North Country Fly. Many North Country flies are also referred to as "spiders", and I really don't know the difference between them. One thing I do know is their simplicity and their fish taking capabilities. 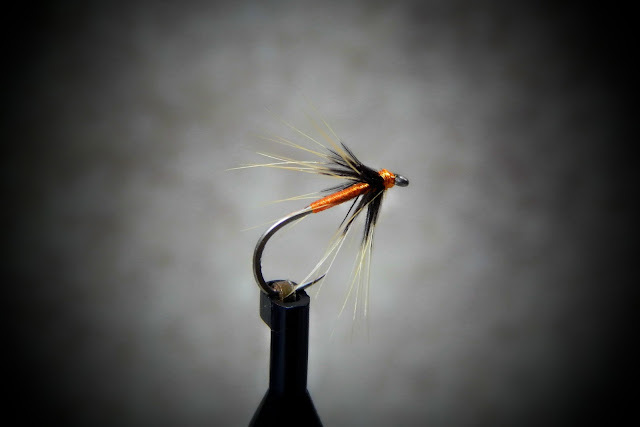 The fly featured here is the Partridge and Orange, with two variations. The material list is but two items...Pearsall's Silk thread and partridge hackle. The variations have peacock and golden badger hackle. The Partridge and Orange...the original pattern. Two materials. The Partridge and Orange with Peacock....this pattern I tie with a peacock thorax. This fly accounts for a great deal of trout. The Golden Badger and Orange....this pattern uses a golden badger feather for the hackle...the natural badger barring gives the fly a blended thorax. A beautiful reflection, "small stream style"
Yesterday was one refreshing day. I had a few things to take care of early in the morning so my start time was delayed some. Once completed and I was on the stream. There was a stiff breeze at times and although the sun was out for the most part there were also those times of clouds and that's when I felt the chill. The rain we had seems to have brought the water levels up, and that triggered a migration. As I moved along the stream I noticed a few things. The places where I had before taken brookies were now void of them. Where did they go? Well I finally managed to get one to take a dry fly. How beautiful is this...a male brook trout decked out in his autumn attire, rising to a classic dry fly...folks it does not get better then that. The water at times looked so black. With the colored fallen leaves it looked like a night sky with the stars sparkling brightly. I managed to fool a few more, I was surprised that all of the trout today were taken on dry flies. But what was a plus this day was the sight of brook trout spawning all along the stream. I did not disturb them for their mission is far to important. Mission accomplished....I viewed to whole process here. Thanks. It was one of the best days of the season. Autumn at it's peak. On a mountain top in Northwest Massachusetts a group of people got together to celebrate and dedicate a portion of land that will be forever as it is today. The conserved property is the Crowningshield Farm. It comprises about 100 acres of beautiful woods, fields, and a wild brook trout stream. A mile of the west branch of the North River is now protected. The achievement was the hard work of many like minded people and groups. This partnership worked together to preserve this area for future generations to enjoy. I would like to thank these groups along with all their staffs who put a lot of effort so this could happen. The Franklin Land Trust, MA/RI Council Of Trout Unlimited and MA. Div Of Fish and Wildlife. I see this as a "Big" victory for the brook trout, but it's really a victory for all who love the outdoors in it's natural state. I hope in the photo's below I can do justice to what is now all of ours to enjoy. I'm a fisherman who's passion is the brook trout, but the hiker, hunter, naturalist and the person who just enjoys solitude has gained from Crowningshield. 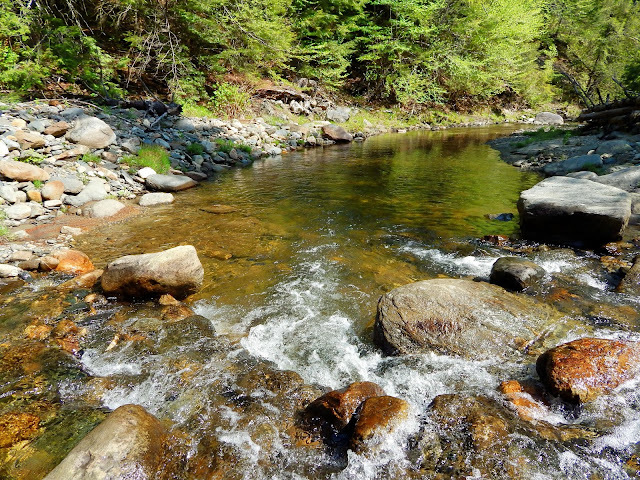 New England...in that valley lies a pristine stream for our beloved brook trout. Simple elegance...I wish I could enjoy a break like this everyday. "Partners"...Rich Hubbard,FLT, Matt Beaton, George Peterson, MA Fish and Wildlife, and Gary Crago and Kevin Parsons, Trout Unlimited. People who have helped in this achievement....thank you. I have been blessed with another place to fish. But the real winner here is the brook trout, for in these waters and within the protection of the surrounding woodlands will thrive for generations to come. Fly fishing is a contemplative endeavor, and small stream wild brook trout fishing takes that to another level. When one walks to the stream and takes in views as this they can be put into a sort of trance. This trance will be there until the first trout is taken. A mid-autumn day, and it found me walking and searching for brookies. They seem to found in the most difficult of places and can take a mad dash for cover at the least little sound they hear. I have tried various ways to sneak up on a pool and sometimes I'm lucky in not spooking the fish. This pool at the stream bend has always intrigued me. There has to be fish holding there. The problem is putting the fly in there without telling the fish your there. Well after many attempts over the months of fishing it I finally got a good result. First cast, as the fly began to sink this brookie hit. This pool takes on the look of black oil flowing instead of water. The water is so very clear it's just the stream bottom is so dark. I love places as this. I could sit here and listen to the stream talk. Just downstream from that beautiful riffle I found this wild jewel. This spot I've mentioned before in a previous post, I call it Daddy "Log" Pool because of the large log that has fallen and lies across the pool. There are some beautiful trout that hold in there but presenting the fly has been a challenge. This outing I was going to try to fish the pool from above the log. As I waded to the right side of the log, lifting my leg in an attempt to get over the log. My planted foot slipped and I found myself sitting in silt and leaf debris. Not panicked I got myself out of the mess and sat on the log trying to get back in order. That's when I looked to the far side of the pool and saw this. I was a perfect position for fishing the pool. I was low, and had a clear cast to cover the pool. Several quiet casts into the pool and the line stopped. I pulled tight and the fish ran. I could tell it was a big fish by the bend in the rod. The fish ran upstream under the log, and I tried my best to stop him without him getting off. That mission was accomplished and I found this wild brook trout at my hand. He was so black he would have looked like a log sitting under water. Just a word about this fine rod....Cane and Silk 5' 2/3 wt. glass rod. This rod gets it done. I just put a new line on it, Cortland 444 DT 3wt, and for me it's the best line to use with the rod. I'll be traveling to NW MA on Wed. for the dedication of the Crowningshield Conserved Property. You might remember a post I did about fishing this beautiful area last May. Since then a great deal of work has been done to the property and I will highlight that in the post I'll do when I return. I would like you to visit this site and check out all the good that is being done to protect that most beautiful of trout...the eastern brook trout. One day last week I had an incredible outing. It was made so not by the number of fish caught but by how. The day was one of those picture perfect mid October days. Bright blue sky with a little breeze, and cool enough for a flannel shirt. I started fishing in a familiar spot and as usual I was recognized and the brookies were scattering. I waited the appropriate amount of time to allow things to settle down and soon I saw the fish return. I tied on a small soft-hackle and cast to some holding fish. I must have cast to those fish for what seemed like an hour and all I had to show for it was a faint move to the fly once. I guess this was going to be one of those days. A slow day is not that bad especially when your spending the time in a place as this. There are a few deep holes on this stream that hold some beautiful trout. Most of these are tough to put a fly... here is one of them. Several styles and sizes of flies were drifted here and finally I had a strike. The brook trout was a female with a beautiful dark coloration. Look at the dots and halos on this fish. A big dry fly fooled this lady. The stream almost seems to blend in with the surrounding land. Ever make a bad cast...a twisted leader and a bunch of line that just heaped up at you feet. It happened here but this brookie did not care. This deep little pocket, right under that fallen log holds some nice size brook trout. Sneaking up on them is the easy part, it's the presentation that gets a little tricky. I'm usually cautious at this for a few casts and them once the trout are spooked or one takes the fly and scatters the rest, then the pressure is off and I let the flies do there thing. And sometimes they do just that.